A look at hobbing machines, hobs, and the hobbing process. Hobbing machines provide gear manufacturers a fast and accurate method for cutting parts. This is because of the generating nature of this particular cutting process. Gear hobbing is not a form cutting process, such as gashing or milling where the cutter is a conjugate form of the gear tooth. The hob generates a gear tooth profile by cutting several facets of each gear tooth profile through a synchronized rotation and feed of the work piece and cutter. This manner of cutting a gear is made possible by the hob effectively acting as a mating worm of the gear; however, this “worm” has gashes in order to provide a way of cutting (generating) the teeth. For a single-thread hob, the hobbing machine synchronizes each revolution of the cutting tool to one tooth of the work piece. For example, such a hob would rotate twenty times per revolution of a twenty-tooth gear. As the hob feeds across the face of the work piece at a fixed depth, gear teeth will gradually be generated by a series of cutting edges, each at a slightly different position. The number of cuts made to generate the gear tooth profile will correspond to the number of gashes of the hob. Simply put, more gashes produce a more accurate profile of the gear tooth. Due to the worm-like nature of the hob with respect to the gear, several cutting edges will be working simultaneously, which provide significant potential for fast cutting speeds and/or short cycle times. With this realization, one can see the hobbing process’s advantage over other cutting processes. All gear hobbing machines, whether mechanical or CNC, consist of five common elements, which are listed below and shown in Figure 2. In summary, the hobbing process uses a worm-like cutter (the hob) that makes successive generating cuts to produce gear teeth. Both the work piece and cutter must be in an exact rotational synchrony. 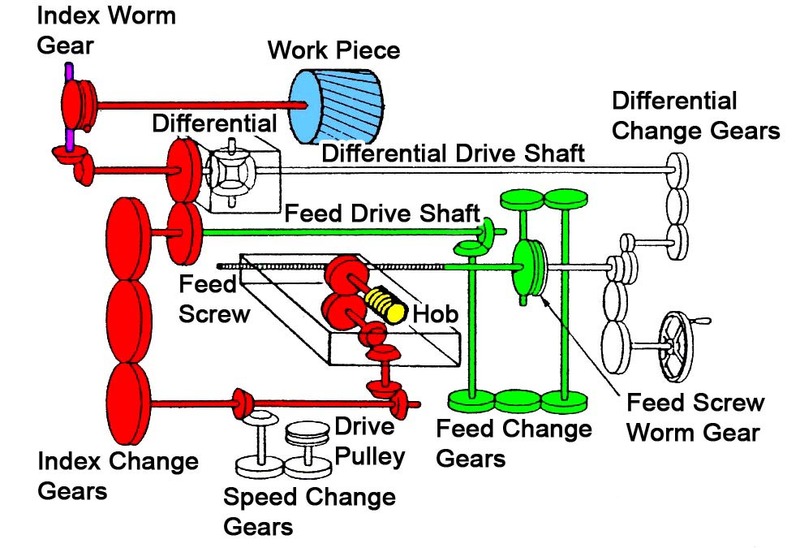 In next month’s article, we will continue by looking at methods of feed during hobbing, the concept of hob shifting, and the method for cutting a helical gear.